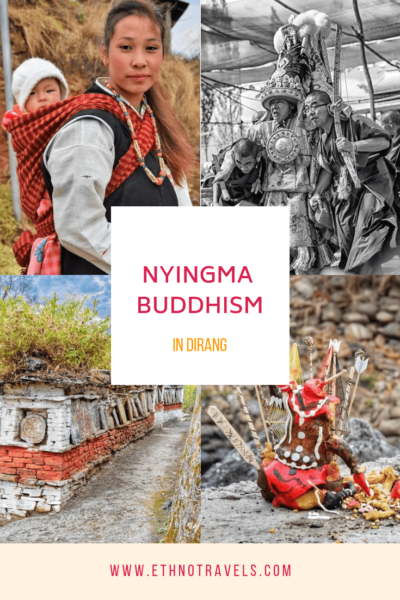 How I trekked with a Nyingma Buddhism group of Lamas and was beaten by the famous Oracle Gyalchen Karma Thinley in Dirang in Arunachal Pradesh. My travels are always very rich in emotions and beautiful encounters and I have fond memories of them. 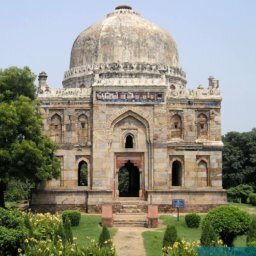 But once is not usual, in this article, I will tell you the most terrifying of my unique travel experiences. My last trip to India, from January to April 2018, was particularly memorable, with the meeting of a famous Nyingma Buddhism Oracle in trance in Dirang in Arunachal Pradesh and the involvement in a problem related to the Naxalite conflict in Bastar. Rest assured, all these misadventures ended well and as often the locals made sure that the following moments were particularly positive. But I must confess, my meeting with the Nyingmapa oracle in Dirang was the most terrifying and memorable experience of my life. The Monpa people of Dirang Dzong. 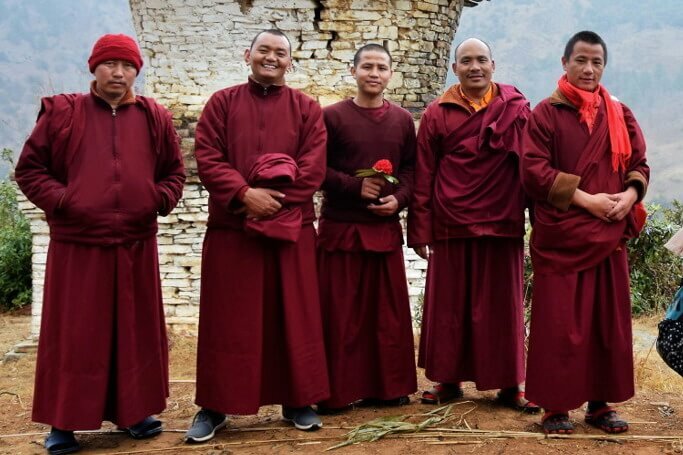 My encounter with a group of Tibetan monks from the Nyingma movement. 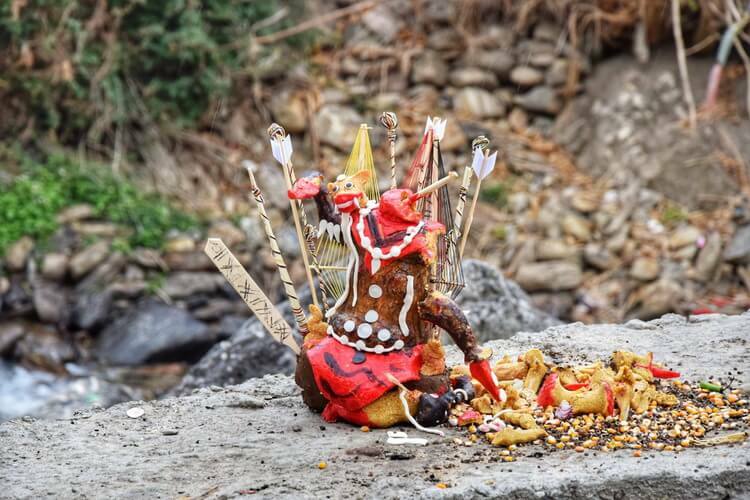 The Tibetan Buddhist Oracle of Dirang. Video of the end of the trance of the Buddhist Oracle. I stopped in Dirang on my way between Bomdila and Tawang. 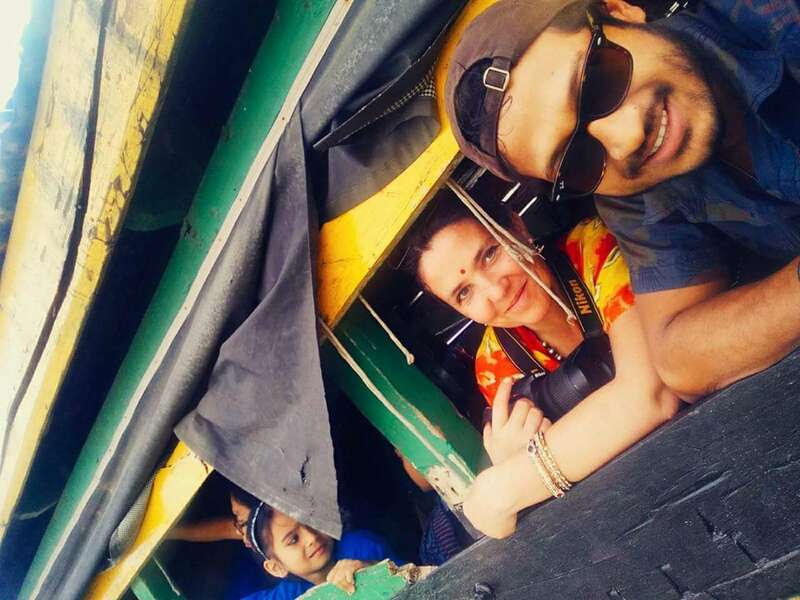 Click here to read about my friend Vidyut Rautela’s solo travel to Tawang. On my second day, I was exploring Dirang Dzong, the fortress of Dirang. 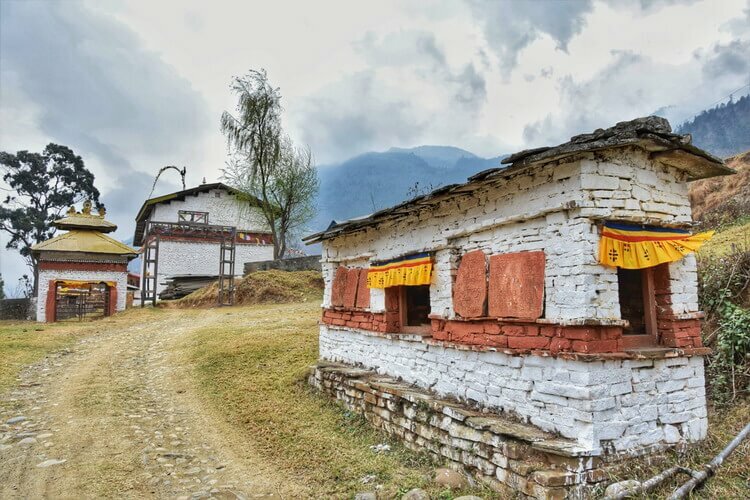 The village, in the middle of the Himalayan mountains, is mainly populated by Monpas, an ethnic group close to the Tibetans. The Monpa people were the rulers of the nomadic Monyul kingdom, between 500 BC and 600 AD. When their kingdom disappeared, it passed under the suzerainty of Tibet but they created some chiefdoms, of which the fort of Dirang is one of the most important remains. 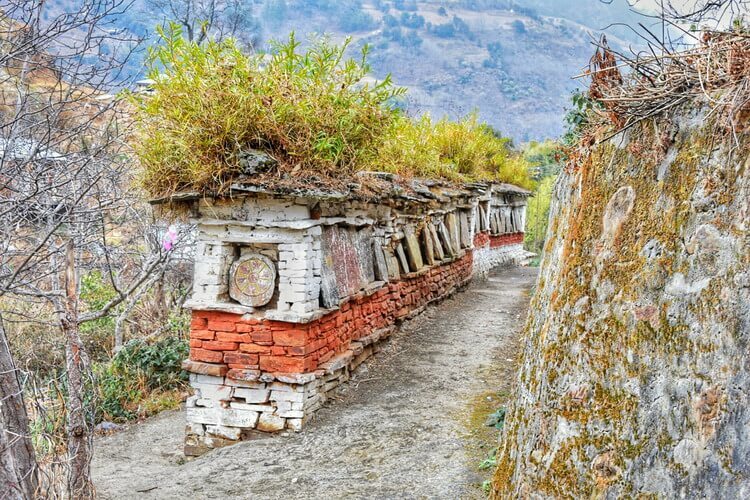 I had wandered among the old stone houses, monasteries and prayer walls, been invited to drink yak butter tea and ended up on a trek to discover Buddhist monasteries and remains… with a group of Lamas from the Nyingma Sect! While I was visiting the first monastery perched in the mountains, the Lama of the place had invited me to share a cup of tea with his friends. They had explained to me that they were coming from various Asian countries to follow the Nyingmapa teaching of the largest monastery of the cult, in Karnataka. Most of them were already confirmed Lamas, spiritual Masters who could teach Nyingma Buddhism. Very quickly, we became friends and they decided to follow me higher up in the mountains, to discover another monastery and its remains. Before this encounter, I only knew the Gelugpa movement, the Yellow Caps Sect, of which His Holiness Dalai Lama is a member. I had been able to visit some of the main monasteries of the cult in the former Tibetan province of Amdo, China, and it remained one of my best travel memories. Nyingmapas can also be found in China, in the former neighbouring Tibetan province of Kham. The Nyingmapa cult is the oldest in Tibetan Buddhism. Its followers are also called Red Caps. It is the movement the most oriented towards the esotericism of Tantrism, giving a primordial role to Padmashambava, considered as the second Buddha, to the devotion to the Master, to the doctrine of Divine madness and to the wrathful divinities. During our visit to the birthplace of the famous Master, these deities were hidden behind curtains and the Lamas explained to me that we are not supposed to look at them. I was also able to see the phallus paintings in another place, which can also be found in Bhutan where the Nyingma cult is very present. The esoteric side of Nyingmapa Buddhism means that the movement has often been seen with suspicion. The Dalai Lamas who had a Nyingma Master for the practice of dzogchen or “great perfection” most often did so in secret. As I walked back to my homestay, I was filled with a deep sense of serenity. Since my encounter with Nyne Chang and the Burmese monks of Mae Sot, I enjoy these special moments with Buddhist monks. I was far from being prepared for what was to come! 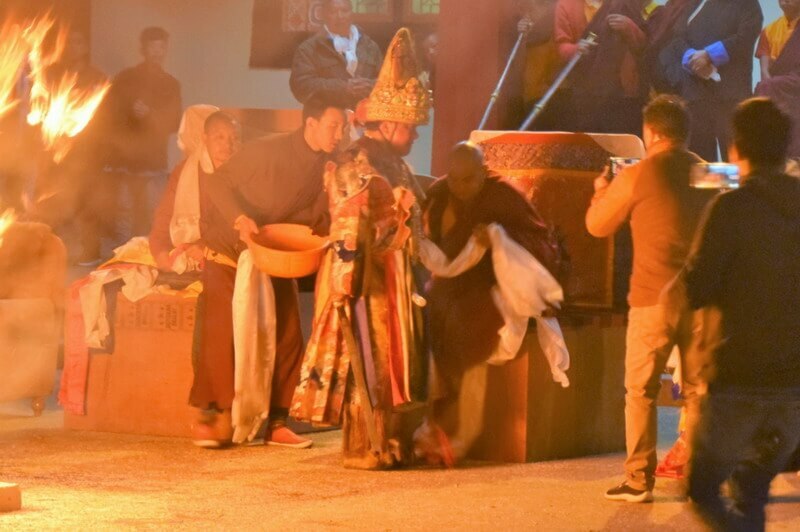 In the monastery near my guesthouse, there was a lot of excitement and I decided to go and see what was going on. A monk explained to me that an important religious ceremony would begin in a moment. So I decided to stay…. Just before the ceremony began, I was told that photos were prohibited. We are all sitting facing the man on his throne. He’s starting to get restless. He’s getting more and more nervous. Suddenly, his body is seized with convulsions. He slumps down, unconscious. I don’t really understand what’s going on. One by one, the chosen ones sit down in front of the man, who looks at them intensely. After a while, he invites them to sit in the crowd or leave the room. 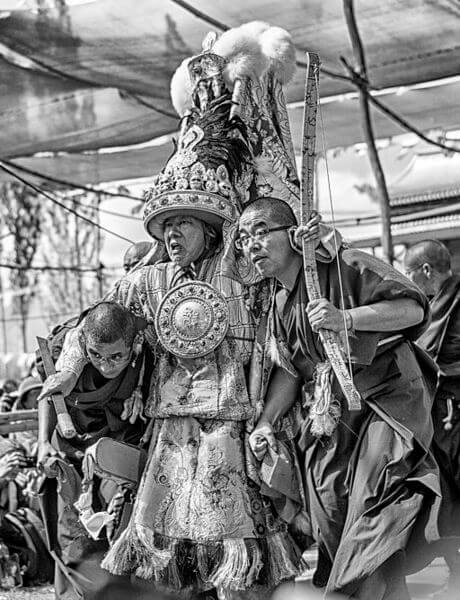 The monks guide the actions of the clumsy devotees. Suddenly, the man gets up, twirls and beats the air frantically with his sword. A murmur rises in the crowd, everyone gets up and runs away outside. While I am on the shock of what I have witnessed, a devotee explains it to me. This man is a very important laic in the Nyingma hierarchy. He has just been possessed by a first spirit. The next ones will follow one another, taking possession of his body one by one. He invites me back into the room to watch the second trance. I even learned after sharing the video of his trance on YouTube that he’s the famous Gyalchen Karma Thinley, protector of Dharma. To learn more about the divinations of oracles, you can read this Wikipedia article or order the DVD below. We’re sitting on the carpets again. The music has restarted. I find it even more intense. I feel the vibrations of the Tibetan horns, the dung chen and the ragdong, throughout my body. My heart seems ready to explode. The oracle gradually fell under the influence of the trance. Again, his headdress is put on and he begins to select the chosen ones. I shiver, divided between the curiosity to live this moment fully and the fear that this man’s gaze inspires in me. I approach, trying to adopt the most respectful attitude possible. I sit facing the oracle. His eyes are piercing me. He keeps staring at me with his intense gaze. I find the moment embarrassing. Should I keep staring into his eyes too or should I look down as a sign of respect? I opt for the 2nd option and very quickly receives a sword blow on the cheek that makes me straighten my head and eyes. I have my answer! Again, I have to look him in the eyes. The minutes follow one another, endless. Possession transforms the medium’s face, bringing frightening smiles to his face. He sometimes makes small screams. I’m standing here, facing him, wondering what he’s capable of. His trance is far from being faked. Suddenly, he starts punching his nose hard! He carries a huge ring in his hand and very quickly blood starts to flow. Blood is flowing more and more. The Oracle collects the blood in his hands and frantically covers his whole face with it before suddenly turning his head towards me and staring into my eyes again. I try to support his gaze while telling myself that my terror must be seen in my eyes and on my face. The chosen ones and the trances follow one another. For the last one, I preferred to stay outside while waiting for the “final” to take place in the courtyard. A young Monpa explains to me what will happen and warns me. I must not film or photograph or I will irritate the spirit and be violently attacked. This boy, who must be about 1.90m tall, is himself not very reassured. 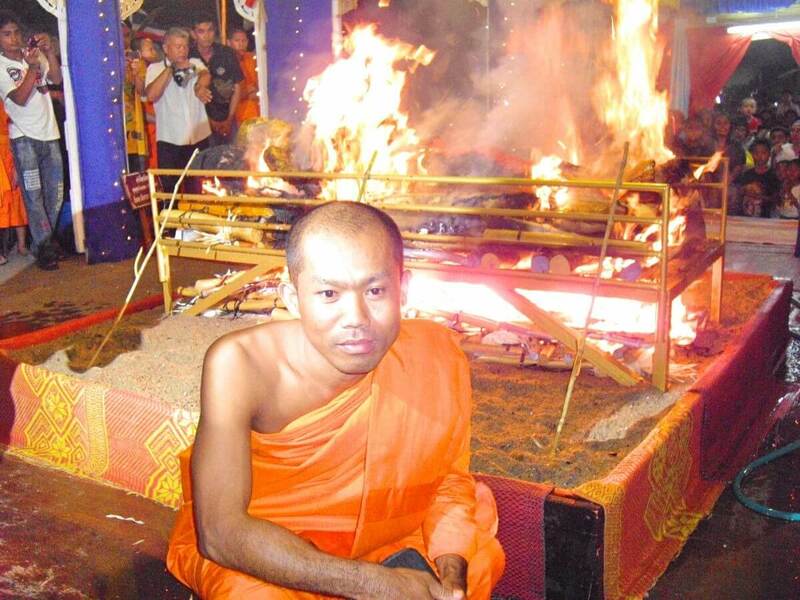 During the last ceremony, he was violently beaten and still has pain in his spine. This time, he decided not to enter the monastery hall. He explains to me that being beaten by the man is a very good thing because it helps to remove the obstacles he should have faced in his life. I tell him that I myself was called and that I received a blow with the sword. The Oracle finally comes out and the young man tells me to hide in the crowd. He’s so scared that he spends his time running away so he doesn’t get beaten up. We took refuge behind the crowd and we are told that the man will catch and kill 3 snakes. I have a hard time resisting the urge to film and the young man tells me very honestly “I could film for you but I’m too scared”. As I try to see through the crowd, I see a snake shaking in the man’s mouth. This time I no longer resist and I take some pictures of the oracle giving the snake to one of the Lamas. The process is always the same: the medium finds the snake, walks around with the wriggling beast in his mouth, gives it to the Lama who observes it, collects it and throws it into the fire. The young Monpa explains to me that the snakes came around the monastery to symbolize the obstacles and challenges that the village should have endured. By catching them and burning them, the Oracle removes these obstacles. The foreign witnesses of the Oracle trance all report the same thing: at the end of the trance, the Medium loses consciousness and falls to the ground. Although I am often particularly lucky when travelling and arrive by chance at key moments in local life, this encounter with the Nyingma Buddhism Oracle in Dirang was a particularly incredible moment. As I watched his trance, I kept telling myself that yes, I was really there and that I wasn’t watching a television documentary. To be perfectly honest, I’m still not totally recovered from this encounter! The keys to being so lucky? Take your time, be curious, don’t be afraid to walk rather than take the transport, dare to approach the events, smile at the locals, talk to them, be sure of yourself. Have you ever had a travel experience that has shocked you? For more unusual anecdotes, see the suggestions below (related articles). These undoubtedly intense experiences and one of a kind. 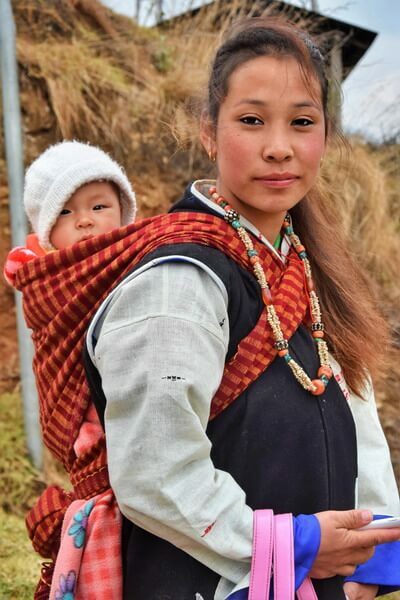 I don’t know too much about life in Tibet, but clearly their are plenty of ancient cultural and religious practises that continue to be important regardless of their practise of Buddhism. I always say try and experience something unique in the places or countries one travels too. 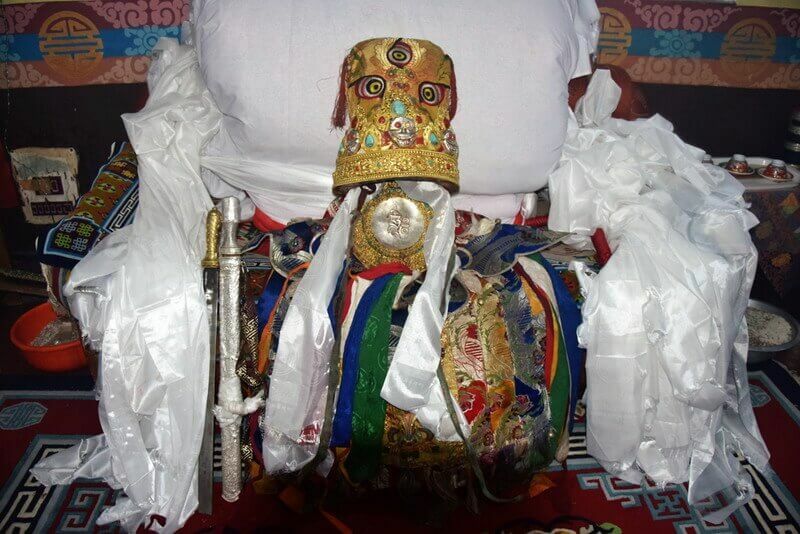 When I was in a part of Ancient Tibet (Amdo province in China), I have seen the ground of the celestial funerals. Luckily there was no funeral as I couldn’t have bear to see it.But this idea to give back to nature – to the vultures – what comes from nature – our body – is interesting.